A company such as Coca-Cola would probably want to surrounding consumers with its media messages and distribution channels all of the time. Anytime anywhere anyone feels thirsty, they should be able to see the Coca-Cola label and be motiviated to reach for a Coca-Cola. But that is obviously demanding a lot from the media. The purpose of this article is to show some data about the coverage of the major media: television, radio, print (newspaper and magazines) and the Internet. We will cite some data from the 2004 TGI Brazil study. This is a survey of 5,312 persons between the ages of 12 to 64 years old conducted during the first half of the year 2004. Within this survey, there is a section when the survey respondents were asked to fill out a 24-hour time diary about their activities on the day before. The responses are recorded on an half-hour basis. 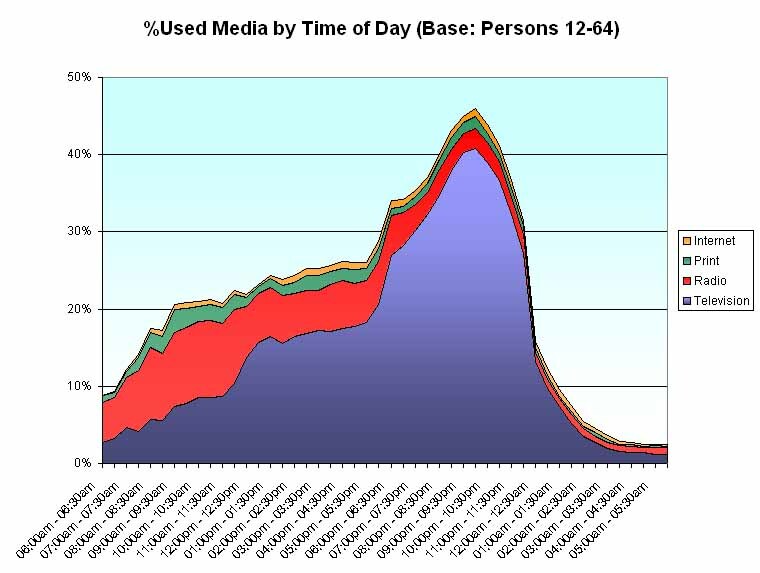 The following chart show the media usage by the time of day. Overall, the time budget for media are as follow: on the average, the average Brazilian allocates 15.4% of their time to television, 4.6% to radio, 1.2% to print media and 0.7% to the internet. The total of these four major media add up to 22.3%. However, this is a straight sum and does not consider the fact that some of these media activities can occur concurrently (e.g. listening to the radio while reading the newspaper). In the following chart, we show the media usage by time of day. The media usage is not constant by the time of day. Obviously, most people sleep at night and would not be using media; and many people work or attend school during the day. In any case, the total media usage does not reach 50% even during the prime evening period when most people are back home from home. In the above chart, the Internet is only a small component. Whereas television has nearly universal coverage in Brazil, the Internet was used by fewer than one-third of the respondents. This automatically means that the non-Internet users will have zero time for the Internet. Overall, the Internet users allocates 14.0% of their time to television, 3.9% to radio, 1.6% to print media and 1.8% to the internet. The total of these four major media add up to 22.7%. The total time on media usage is about the same, but the relative allocation has changed. The Internet users spend less time on broadcast media and more time on print media. 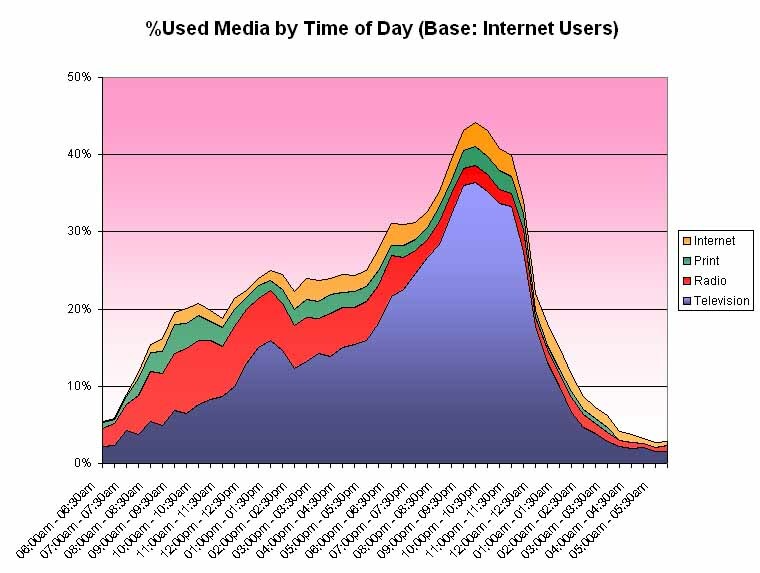 In the next chart, we show the media usage by time of day for Internet users only. The amount of time given to the Internet has increased at least three-fold by definition. A comparison of this chart with the one for the total survey universe shows some interesting details, such as the marked lunch-time bump. In looking at the two charts, it is easy to come to the conclusion that the Internet is cannibalizing television. This would be purely hypothetical and the data as presented here can neither confirm nor deny the hypothesis. There exists the possiblity that the Internet users had different demographic charcteristics to begin with (i.e. education, occupation, etc) and would have less broadcast media usage anyway, with or without the media (see, for example, The Impact of the Internet on Television Viewing and Television vs. Internet Usage).